Undiesofwondy is an up and coming plus sized cosplayer from the New York area. 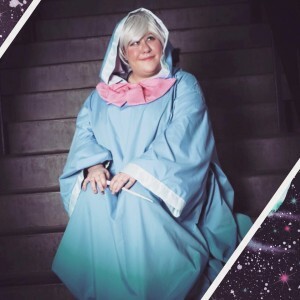 She strives to perpetuate a positive community for all cosplayers and convention attendees alike by promoting body positivity and anti-bullying groups, such as the local group she co-founded ‘CosUNITY’ to unite the Upstate New York Costuming Community. Undiesofwondy has been featured in many print publications such as ‘We Rise Magazine’, ‘IModelZone Magazine’, Cosplay+ Magazine (where she was the January 2015 Cover Girl) and in promotional material for New York Comic Con/ReedPOP ‘s website (2013). She also regularly blogs and podcasts with ‘The Brotherhood of Evil Geeks” at EvilGeeks.com for their podcast “Transmissions from the Evil Lair”. You can find her online at http://undiesofwondy.com/ or on her Facebook page http://facebook.com/undiezofwondy/ to learn more about her various projects and events! The Brotherhood of Evil Geeks (EvilGeeks.com) is a website dedicated to providing you with all things evil, geeky and awesome. EvilGeeks was co-founded by C-mart and Big Evil in 2012, and has since grown to include more than seven contributors. It is also the home of the podcast “Transmissions from the Evil Lair”, where current and past pop-culture topics are covered, as well as interviews with popular and up-and-coming talent from all walks of geek life. You can check them out online at http://evilgeeks.com/ or http://facebook.com/evilgeeks to join The Brotherhood!